One dark, January evening eight months ago, I was trying to get my stories finished at work and get home at a decent hour. It was close to 5 p.m. when my cellphone rang with a tip. As if, I thought. Nothing could be bigger than the Oland murder, an unsolved case involving the Moosehead Breweries family that rocked the city two years ago. Still, I thought it should be checked out. I called more sources, who acted shifty when I asked what was going on at Martha Avenue. A photographer’s sixth sense kicked in, and was eager to tag along with me to the scene. Off we went. We parked at the top of a knoll, out of sight of police who were arriving on the quiet, residential street. The officers walked in a duplex in plain clothes. Within a couple minutes they walked out with a man in cuffs. Cindy, the photographer, burst out of the car and snapped away furiously. She showed me her preview screen. The image was grainy in the failing light. But my stomach dropped. It was sickening. It was the same city councillor I had spoken to dozens of times before. And somehow, I instantly knew why. The rumours were true. He was sexually abusing little kids. I could barely operate my phone to call my editor at the newsroom to explain what we saw. 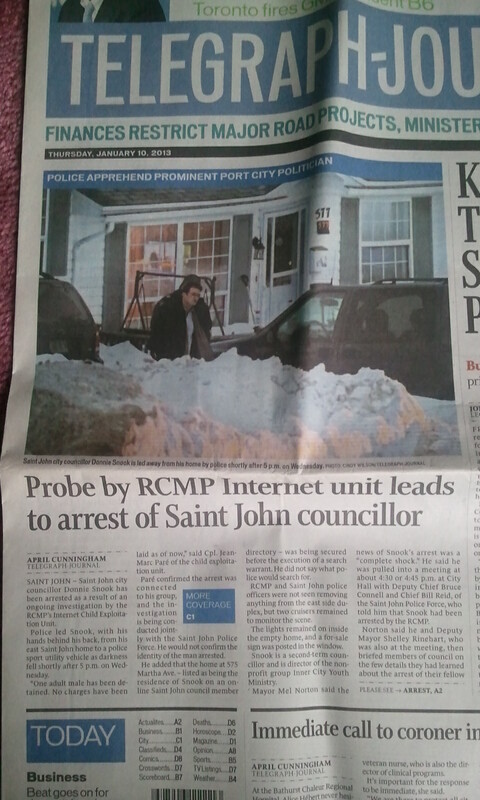 A few minutes later, I confirmed it was the RCMP’s Internet Child Exploitation unit who made the arrest. We all hoped it was a mistake. This past week, it was confirmed once and for all that it wasn’t. For two full days in court, we heard stomach-turning details about Snook’s crimes. He admitted to his guilt on 46 charges on 17 male victims over the past 12 years. The betrayal this community is feeling is palpable. I sense it in so many people I speak to on a regular basis. There is a lot of anger too. But most of all, a sense of loss. The loss of innocence in all those children, who only needed someone to love. One mother told me it felt like someone had died when she found out Snook had taken sordid videos of her son. I heard her cry in court as Snook promised he never disseminated those videos online. There’s no proof, but we’ll probably never know for sure. My job is to report these things. I am only the messenger. But I can’t help but feel drained, empty, and sick after telling these stories. I hesitate to express how all of these affects me personally, because I feel like I have no right after the horror so many others have gone through. This is why I run. I run to turn what would otherwise be tears into sweat. To turn negative, hopeless energy and sadness for humanity into something more positive. The longer the run, the better.